All-New Chevy Bolt Review – See Specs, Features and More! 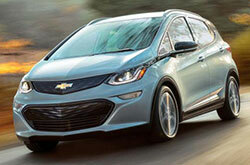 The all-new Chevy Bolt is the automaker's latest addition to its green car lineup. Featuring a 200-mile, all-electric range, the Bolt is already garnering praise from those looking for sporty and affordable electric vehicle options. Sporting an aerodynamic design, as well as a host of high-tech interior features, the 2017 Chevy Bolt in Springfield is sure to be one of the most popular cars in Chevy's lineup. Drivers will find a host of exciting features and amenities available on the Bolt, including a floating center dashboard that boasts a 10-inch color touchscreen. This touchscreen houses all of the Bolt's tech, audio and navigation features, which have been praised by numerous 2017 Chevy Bolt reviews. The navigation system has been an especially popular addition, as it tries to designate routes that provide the maximum range for the car's power levels, while also providing locations for nearby charging stations. 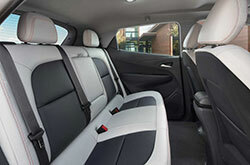 Other interior features include an energy-efficient form of Bluetooth, OnStar 4G LTE connectivity and dual smartphone slots. 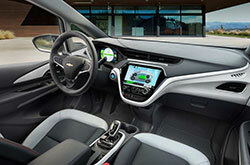 2017 Chevy Bolt reviews have been quick to point out the electric car's impressive powertrain that consist of an electric motor and a 60kWh lithium-ion battery pack. This system is rounded out by a direct-drive transmission, which helps the hatchback get the most out of its 200 horsepower and 266 lb.-ft. of torque. The Bolt will come with a 7.2kW onboard charger that can be connected to a 240-volt outlet that Chevy estimates can recharge the car in less then two hours. Drivers will also have the option of purchasing a fast-charging connector that adds up to 90 miles in just a half an hour. 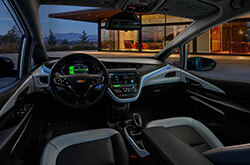 As part of their commitment to technology-based systems on the Bolt, Chevy has also put several high-tech safety features on the all-new electric car, including several radar-and camera-based systems, such as Forward Pedestrian Alert, Side Blind Zone Alert, Rear Cross-Traffic Alert and Forward Collison Alert. Drivers will also find 10 airbags, OnStar Capability and an advanced high-strength steel body frame. Stop by Reliable Chevy today to take the 2017 Chevy Bolt in Springfield for a test drive! If you want a new car near Springfield, don't just look at the 2017 Nissan LEAF and the Tesla Model 3; also view the attractive 2017 Chevrolet Bolt. Its finely crafted exterior styling and easy-to-use cabin amenities may eclipse your expectations and meet your needs. Utilize our review and try out the compare tool to see if the 2017 Chevrolet Bolt is right for your daily needs; and after, check out financing and leasing incentives available at Reliable Chevrolet. 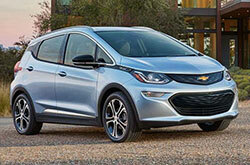 Want to see cost-effective manufacturer incentives on the new Chevrolet Bolt? Then make sure you visit us - your neighborhood Chevrolet car dealership. We hope the facts and figures in our 2017 Chevrolet Bolt review will be usable when you make your eventual purchase decision. We have a gigantic assortment of handsome Chevrolet Bolt models at Reliable Chevrolet in Springfield, MO - drive one today. 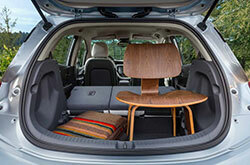 Can't wait to see its spectacular cabin amenities in the flesh? Play our video recording now!